In the middle of November 2012, when I was supposed to be in hiding, as hinted darkly in the FIR, I was actually very much in the public eye. 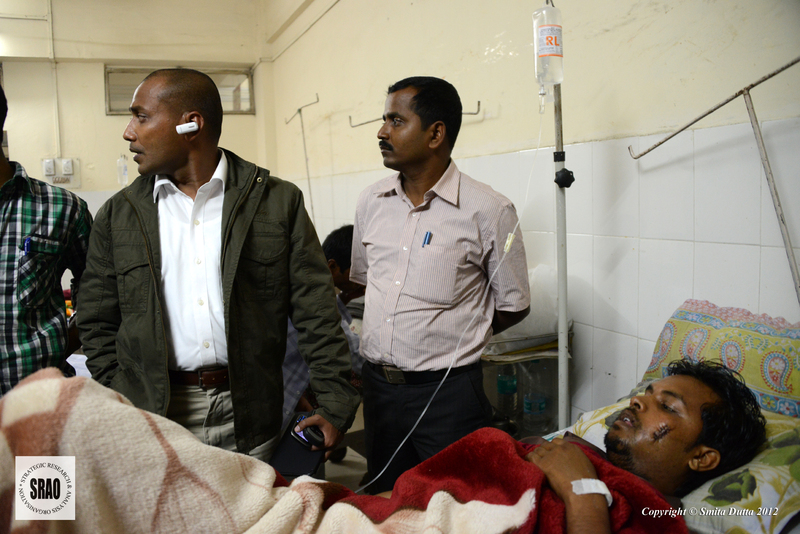 Seen here on the night of 16 November 2012 at the Guwahati Medical College Hospital (GMCH) paying a visit to Ikramul Ahmed who survived a shooting by Bodo extremists at point blak range in Kochugaon in Kokrajhar on 14 November 2012, and whose shifting to GMCH I had personally overseen. I have already revealed, in “How I became a Most Wanted RAW Agent” – I, how in the feverish imagination of a bunch of Assam Police officers and the media, I became a RAW agent with almost supernatural powers of being able to change form from my father to myself while jumping off a building. Or, how my family and I possess such supernatural powers to be omnipresent in cities thousands of kilometers apart or be able to live in hotels without leaving a trace in the guest registers or sign a single bill during our stays in “How I became a Most Wanted RAW Agent” – II. I shall now reveal here how FIRs can be filed and cases registered under cognizable, non-bailable sections of the IPC by the Assam Police without even a crime being committed, with patently mala fide intent, because I had to be arrested for ‘something’. This was the case which I was arrested in, allegedly for failure to pay house rent for months, security deposit for the same and because the cheques I had issued had allegedly bounced. How much truth there is in the allegations shall be evident from the FIR itself. In order to do so, I produce below the FIR, word-for-word, of the case for which 5 days ‘police custody’ was sought for me (which was of course rejected outright by the court), even though I was seriously wounded and should have been in hospital. Sub: THE COTTAGE ON RENT – First Information Report (FIR) in respect of Locking the Cottage by the Tenant Mr. Nilim Dutta for last 1 ½ months, non payment of Rent from Nov. 2012 and Security Deposit of Rs. 1.25 lakhs due on 29.08.2012 i.e. the Date of Signing the Agreement. (1) In response to our Advt. of the Cottage for rent released on the Assam Tribune dt. August 5th, 12th, & 19th 2012, (all Sundays) Mr. Nilim Dutta approached us for rent of the cottage and signed an Agreement for the same for 11 months w.e.f 29-08-2012, the date of signing of the Agreement. A copy of the Agreement is enclosed herewith. (2) On the date of the Agreement dt. 29-08-2012, Mr. Dutta handed over a cheque of Rs. 1,25,000.00 drawn on HDFC Bank Ltd. Fancy Bazar towards the Security Deposit with a word to present the cheque to our HDFC Account at Khanapara Branch after one week when Mr. Dutta gets his funds transferred from New Delhi. However the Security Deposit amount could not be encashed, as Mr. Dutta every time pleaded that his amount is yet to be transferred from his Head Office, New Delhi. As a result the cheque remained uncashed and is no longer valid today. (3) The Cottage rent for the month of August, September and October, 2012 were paid but the rent for the month of November 2012 not yet paid, though due on 4th December 2012. (4) Initially, Mr. Dutta, his sister along with his father and mother stayed together in the Cottage. However, intermittently his mother and father informed that they go to Jorhat, Tezpur etc and stay there, while Mr. Dutta and his sister now and often go to Bodoland as his official duty and stay there weeks together. On occupancy of the Cottage w.e.f. 29-08-2012, Mr. Dutta and his family did not bring any furniture, fixtures including sleeping cots. They started sleeping on the floor telling us that they are gradually arranging sleeping cots, but they said they feel comfortable sleeping in the top floor. Till date, they did not brought any furnitures and beds. (5) From October 2012 last, Mr. Dutta’s parents started staying elsewhere but occasionally came to the Cottage and stayed a few nights and then again gone. (6) Since November 1st week, 2012, the Cottage is kept locked, all doors and windows closed. However, at dead of midnight Mr. Dutta used to enter the campus and silently unlock the main front door of the Cottage located in the entrance verandah, then opens the back door of the Cottage, then lock the front door as well as the back door, giving an impression that nobody stays in. It is very difficult for us to know when he comes and goes and what he does inside the Cottage. Gradually, we could find that somebody was using the top floor bathroom as the drain pipe’s discharge from the top bathroom flows through the back side drain of the Cottage. This proves that somebody stays at night in the Cottage without our knowledge. This poses a great serious security threat to us and the entire campus under present day condition. I am in receipt of your earlier mail and I asked Nirajita to leave it to me to reply to. There is absolutely no need to worry and not only will I reply but resolve all other matters as well late tonight. Just that an exceedingly hectic schedule till this evening will keep me preoccupied here in Delhi. I have been compelled to revoke the Clause 02 (XV) of the Deed of Agreement, dated 29-08-2012 with immediate effect i.e. by December 29th , 2012 you are to peacefully hand over the possession instantly and notify to you any consequential damages caused by you to the property for payment etc. with information to the Officer-in-Charge, Dispur Police Station, Guwahati 781006. I regret to state that till date as addressing this letter to you, we have not received any word from Mr. N. Dutta. In view of the above extreme circumstances we have been put through since 1st November 2012, I have the honour to inform you the same and sincerely request for arranging our entry into the Cottage under clause 02 (XV) of the Deed of Agreement, dated 29-08-2012 in your presence on December 29-12-2012 at your most convenient time. (1) Copy of Agreement, dated 29-08-2012. The above FIR is dated 27/12/2012 and a case was registered on its basis the same day. The problems with the above piece of fiction are numerous. I shall point out only the ones most relevant, legally. That it is a lie is evident from the fact that the copy of the cheque drawn on HDFC Bank Ltd. Fancy Bazar which he has enclosed with the FIR is dated 29/09/2012. Was I supposed to pay them the Security Deposit within a week from 29/08/2012 with a cheque dated 29/09/2012? Or was there explicit understanding which was entirely different as would be revealed by e-mail records that is being produced before a competent court? Truth is, a cheque dated 29/09/2012 (which is actually the date of the Cheque issued as established by the enclosed copy) would be valid till 29/12/2012. Hence the claim that the cheque was ‘no longer valid’ on 27/12/2012 is entirely false. What prevented Mrs. Archana Sharma from depositing this valid cheque in her account of 27 December 2012 if indeed the Security Deposit was outstanding? Also, when the cheque itself was valid and the same had not even been deposited, let alone being dishonoured due to insufficient funds, what crime had been committed for a case to be registered? Truth is, as per the Deed of Agreement for the Cottage signed on 29 August 2012, that the rent of Rs. 25,000 per month would be calculated from 1 September 2012, is explicitly mentioned in the Agreement, and that it would be due on the 4th of each successive month. Hence, the rent for the first month, that is September 2012, was due on 4th October 2012 and duly paid and record of payment obtained. And it continued without default even for a single month. Therefore, isn’t the rent for three months, as explicitly admitted in the FIR, actually for the months of September, October and November 2012? Isn’t it therefore a fact that on the date the FIR was filed and a case was registered with congnizable, non-bailable sections of the IPC based on it, that is on 27 December 2012, not even a month’s rent was due and rent for the month of December 2012 was due only on January 2013? Even here, not even a cause of action even for a civil suit had arisen, let alone a criminal case under cognizable, non-bailable sections of the IPC. Why was it so important that it was done in spite of absolutely no grounds for registering a case? There are numerous other false claims as well. In para (4) of the FIR it is claimed that my family had lived in the said bungalow from 29/08/2012. Whereas, Dispur PS Case No. 2432/2012 u/s 420/406/511 of IPC registered on 8 November 2012, claims Shri Dulal Chandra Dutta’s family lived in Hotel Nivedan in that period till October 2012. Again, Dispur PS Case No. 233/2013 u/s 420/406 of IPC registered on 3 February 2013, on the other hand, claims that my family and I have been residing in yet another address since July 2012. Can all of these competing claims be true? The truth, however, is that even on the evening of 8 November 2012 (the day the Dispur P.S. Case No. 2432/2012 was registered), at about 4:30 pm, when ASI Arun Baruah, along with a few armed police personnel from the Dispur PS had come to that very same bungalow, which was supposed to have been kept locked, he found it very much occupied as would a normal bungalow used as a temporary ‘control room’ with living quarters would be. ASI Arun Barua also found me in that very same bungalow, along with some staff, and we had a not very amicable interaction in its living room. I must also add that ASI Arun Baruah did not have to climb in through the window or break open the lock (which would have been illegal) to enter the house. Raghu Rai and my mother at Cottage # 3, Rukmininagar, Guwahati (which acted as my ‘control room’ for our work in the violence affected districts of Kokrajhar & Chirang whenever I was in Guwahati) on the evening of 14 November 2012 before the informal dinner I hosted. On the evening of 14 November 2012, on my return from Kokrajhar that evening, I hosted a small informal dinner in that very bungalow where Mr. Raghu Rai and his daughter, who had spent their Diwali with us among the victims of the ethnic conflict in Kokrajhar and Chirnag, too were present. I don’t remember Mr. Raghu Rai and his daughter climbing in through the window or sneaking in through the back door. Also present in that dinner were Mrs. Archana Sharma and Mr. Mrinal Kumar Sarma. I am rather curious whether they climbed in through the window or sneaked in through the back door. Yes, there are photographs and other evidence to prove the same. On the evening of 16 November 2012, on the live TV debate “Proxongokrome” in DY 365 on the ethnic violence in BTC districts of Kokrajhar & Chirang. (From left) Bhupen Bora, (then Parliamentary Secretary for Home, Government of Assam), Mrinal Talukdar, Haider Hussain (Editor, Asomiya Pratidin) and I. It was on this show where it was announced that there will be a crackdown on armed elements in BTC who were responsible for the violence. Next morning, Mono Brahma, Executive Member BTC, was arrested for possession of illegal AK 56 rifles and ammunition and police security of a number of prominent BPF functionaries were withdrawn. 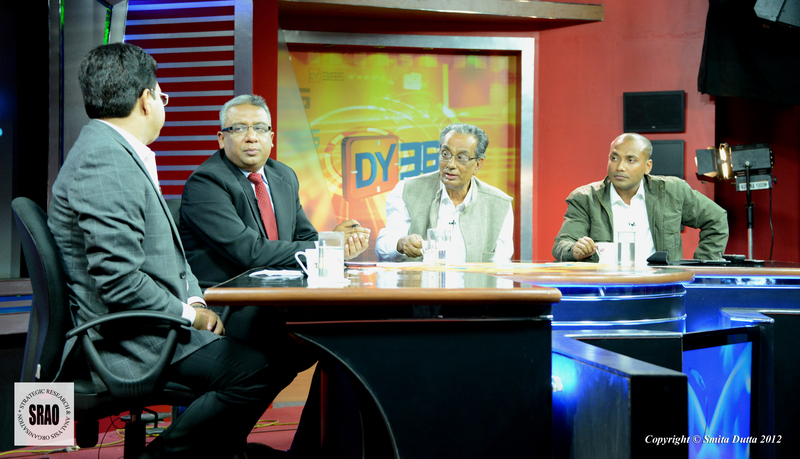 Two days later, on the evening of 16 November 2012, I appeared on the live TV debate on DY365 along with Bhupen Bora, who happened to be the Parliamentary Secretary in charge of Home for Government of Assam, and who played a instrumental role in dealing firmly with the law & order situation in Kokrajhar and Chirang arising out of the ethnic violence there and Haider Hussain, then the Editor of Assam’s largest circulating Assamese daily, Asomiya Pratidin. 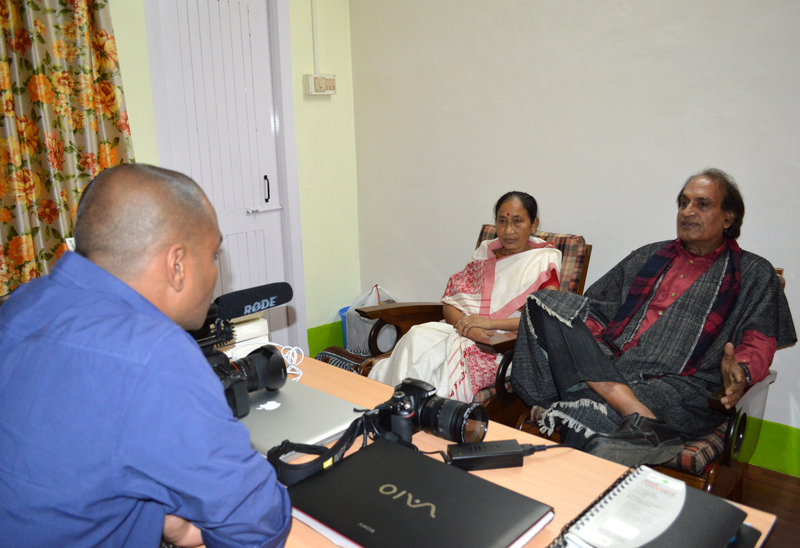 Mrs. Archana Sharma, Mr. Mrinal Kumar Sarma, their daughter watched the show sitting in the living room of that very bungalow with my parents who came visiting. Since I was at the studio of the television channel, I wouldn’t be able to tell whether they all climbed in through the window or sneaked in through the back door. Surprisingly, Mr. Mrinal Kumar Sarma also claimed on TV after my arrest on 2 February 2012, that the house was kept locked from first week of December 2012 which contradicts his own claim in the FIR that it was kept locked from 1 November 2012. There is a lot more to this story than I am revealing here, and shall be dealt with in an appropriate court of law, but what must not be overlooked is that if Mrs. Archana Sharma and Mr. Mrinal Kumar Sarma had communicated to me on 20 December 2012 that I was to peacefully hand over the said premises on 29 December 2012, as mentioned in para (7) of the FIR, what was the ground for even approaching the police to have a case registered under cognizable, non-bailable sections of the IPC against me just two days prior to the intended handover? Why was it at all necessary to plead to the police to arrange for an ‘entry’ into the bungalow, as prayed for in the last para of the FIR, when it was to be handed over anyway? Was the FIR to be the ‘excuse’ for the police to enter the bungalow and take possession of what was believed to have been kept in it, like damning evidences of findings from our probe into the ethnic violence in Kokrajhar and Chirnag? I was as yet unaware of these developments, when on the morning of 29 December 2012, I received a call from the daughter of Mrs. Archana Sharma and Mr. Mrinal Kumar Sarma curtly informing me that they will enter the bungalow and take possession of everything. As I was still in Delhi on that day. I immediately warned them of the consequences of such an unlawful act through an e-mail. Was this also a ruse to make me rush to Guwahati, something which I refused to fall for anyway? In an e-mail on 4 January 2013, Mrs. Archana Sharma and Mr. Mrinal Kumar Sarma communicated to me that, “Your belongings in the property are under lock and key and to the visible eye, there has been no break-in. Let me assure you that I do not plan to do any unlawful break-in……,” contrary to what they pleaded for in the FIR just barely a week ago. The matter was still unresolved when I returned to Guwahati from Delhi. I was still unaware of that a case under cognizable, non-bailable sections of the IPC had been registered against me on patently false allegations. When I was arrested on the night of 2 February, 2013 and produced in court on 3 February 2013, this was the only case where 5 days police custody was sought, even though I should have been in the hospital because of the serious injuries. The Investigating Officer (IO), S.I. N.K. Das, hid my medical reports and tried to pass off my injuries as having been sustained earlier. It was my sister Smita, who was produced before the judicial magistrate too, who disputed the IO’s version of events and exposed his lies. When the judicial magistrate questioned the Investigating Officer as to why was my custody at all needed, there was no explanation from him. Already finding the IO to be lying, the lady who was the judicial magistrate we were produced before, came out of her court room to speak to me in the police vehicle where I was lying and angrily rebuked the IO and not only rejected his plea for my police custody, but directed the jail authorities to have me admitted to the Guwahati Medical College Hospital immediately and then file a compliance report within 48 hours. Wasn’t my police custody sought because that was the only way they could enter the bungalow without unlawfully breaking-in or without securing a search warrant? And wasn’t that the intention because that was the only way they thought could take away the mass of collected documents and evidence? Fortunately for us, what they believed we had left lying there in the bungalow was put away in safe custody long before that. (1) Even in this FIR, there isn’t even a sentence accusing me of claiming to be a RAW official. (2) Even in this FIR, there isn’t even a sentence accusing me that any cheques I had issued had been dishonoured due to insufficient funds. Will the media, which widely reported the above allegations, now clarify where from had they quoted these charges? The bitter truth is, on 27 December 2012, there was no ground for even a civil suit or a complaint under the N.I. Act, let alone a criminal case under cognizable, no-bailable sections of the IPC.